I worked the book discussion this evening. Mr. Jack Kerouac, you are not that popular in Ten Sleep! Art Challenge for today is halfway completed… I wanted it to dry and then, simply forgot about it! 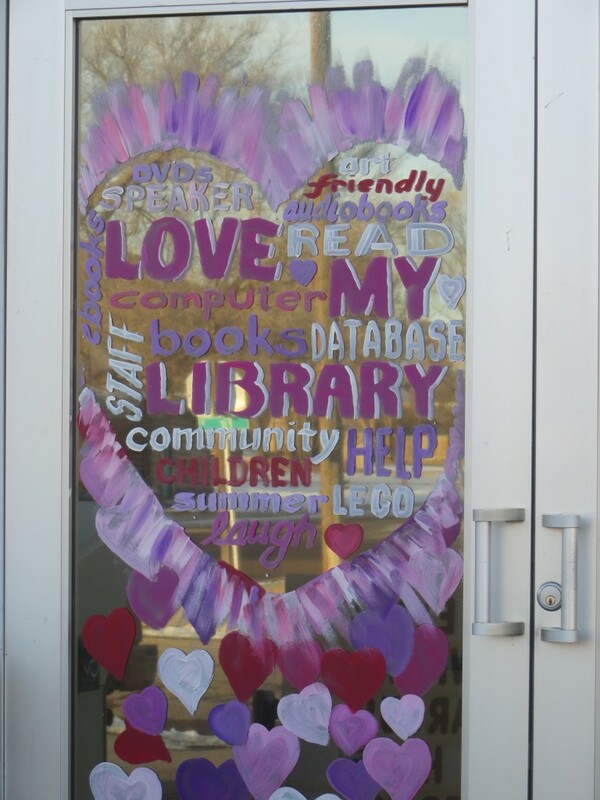 I painted the front door on the library, Happy Valentine’s Day from The Friends of the Ten Sleep Library! I followed Brandon around this morning as he was driving the new bale feeder. That’s lots of movie editing to do… which I *don’t* do at 11 pm! I investigated wire jewelry today and fell in love with this artist. Visit nicolehannajewelry.com and be amazed! Somehow, there just wasn’t a rhythm to my day! BB would have like your discussion on Kerouac and Ginsberg. He’s read them. Oh, I love your door! So sweet!